One day in June, newly minted geography graduate Jessica Williams (LAS ’14) stepped from a helicopter onto the Pu’u O’o Cinder Cone on the Big Island of Hawaii. This active eruption site in the east rift zone of the Kilauea Volcano keeps scientists with the U.S. Geological Survey (USGS) on high alert—and with good reason. In fact, only four days after Williams touched down, the entire area collapsed, sparking a dangerous lava flow that ultimately overtook the village of Pahoa. The USGS’ Hawaiian Volcano Observatory is located in Volcanoes National Park, one mile from the rim of the Halema’uma’u Crater. The red areas of the map above indicate the June 27 outbreak location. This process isn’t as simple as it may sound. “In order to identify unusual activity, I had to learn how to read through the noise,” Williams notes. “Helicopters, military activity and even people walking around on the mountain can cause activity that could be mistaken for seismic events.” With practice, Williams was able to recognize such critical information as the duration of a quake and its origin location. The days when Mauna Loa was silent were equally important, since patterns over time give scientists a better understanding of the the rumblings of the earth. 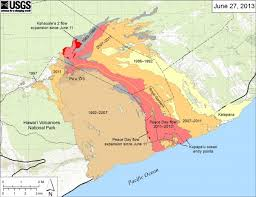 Follow the Kilauea Volcano lava flow.